Beatrix Potter really did produce some unforgettable characters that are certain to capture children’s imaginations. Why not delve into the world of Peter Rabbit with your children. There’s plenty to explore. And once the children are familiar with the characters, why not give this vegetable maze a go. It’s perfect for developing dexterity and pencil control. 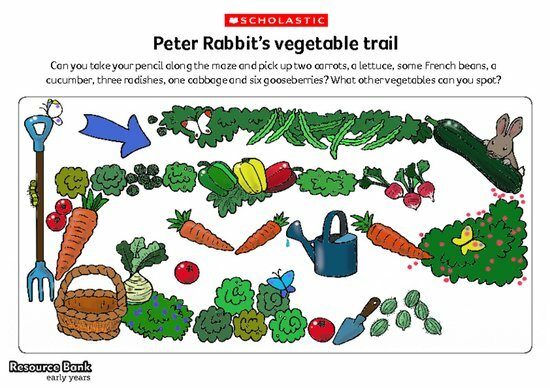 How many of the vegetables can the children identify? Can they count how many there are of each type? Early Years members of the Scholastic Resource Bank can get instant access to this teacher resource and thousands more online resources. Our finely crafted resources include lesson plans, teaching ideas, planning and assessment tools, activity sheets, interactives and video.